A special Tooth Fairy for that first missing tooth. 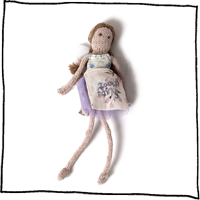 Each little Tooth Fairy is hand knitted and dressed in a vintage fabric tutu with her own special 'tooth pocket' apron. The tooth can be placed in the pocket before bedtime and replaced with a coin by the morning. Dolls are knitted in pink or brown lambswool and are available with brown, blond or ginger hair. Each doll comes beautifully packaged in a gift box. Dimensions: Each doll is approx. 18cm tall.